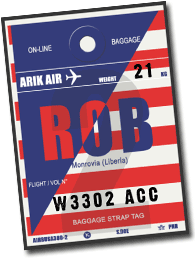 Monrovia – An aircraft belonging to Air Cote D’Ivoire has been grounded at the Roberts International Airport (RIA) since Sunday after the plane encountered some engine malfunctions, FrontPageAfrica has gathered. A passenger, who was onboard the plane when the incident occurred, told FrontPageAfrica that it started showing signs of faultiness in Abidjan on Sunday when it was bound for the Roberts International Airport but still flew to Liberia after a six-hour delay. “We then left at around 6:30 and when we landed at ROB they made the passengers board and this time was worse because in an attempt to take off, the pilot slammed on brakes and everyone was terrified,” the passenger who asked for anonymity told FrontPageAfrica. The passenger further informed this paper that an attempt by the same flight to take off the same day failed after the pilot experienced some problems with the brakes. “Most of the passengers were terrified, even me, I was very afraid. I think the airline should have told the passengers exactly what was happening rather than endangering all of our lives. It was the mercy of God that kept us,” another terrified passenger said. The plane has since been grounded at the Roberts International Airport, leaving several passengers stranded. A local manager of the airline in Monrovia confirmed to FrontPageAfrica that the aircraft had some issues but failed to state exactly what ensued. He, however, said technicians were brought from Abidjan to carry out some repairs but were awaiting some spare parts from overseas, which is expected to arrive in the country on Tuesday. He declined to state the number of passengers on board when the incident occurred. In time past, many airlines including American Airlines, Delta, and Air France ceased flights to the Roberts International Airport due to the dilapidated condition of the runaway at the time. In 2012, RIA runway inflicted damage on an AF752 Air France aircraft after a rugged landing caused damage set at almost half a million dollars. The Plane’s bottom right, main landing gear, hydraulic holes, brakes, and right main landing gear axle assembly were damaged during a landing mishap. But the RIA runway is no longer in tatters. A new runway funded through loans and financing from the Arab Bank for Economic Development in Africa and the Liberian government is nearing completion. Sinohydro Corporation Limited, a Chinese firm, is implementing the project. It’s a US$30 million project, which is giving the country’s only international airport a major facelift and will attract more airlines to Liberia. Former President Ellen Johnson Sirleaf broke ground for the pavement as well as the construction of the US$50 million passenger terminal at RIA on Nov. 21, 2016. Sirleaf said the project would bring transformation to the country. “Improving the airport will be a milestone in Liberia’s social and economic development,” she said, adding that modernizing the airport will further promote economic growth and development for all Liberians. Sirleaf explained that the delay in improving the airport was a result of competing interests. “RIA had to be put aside for some other emergency priorities in the interest of the country,” she said. But a source at the RIA says the Ivorian airline malfunction has no impact on the airport administration but it renewed concerns about the quality of aircraft flying to the country. One industry expert, who witnessed the situation on Monday, added called on the Liberia Aviation Authority to ensure planes flying into the country meet international safety standards in order to protect passengers.